One of our readers asked the following question, When Should I Change Oil in My Snow Blower Spring or Fall? We will answer these questions in this post. We will also share an approach to draining the oil from the engine that avoids oil being spilled all over the housing, the tire or on the ground. 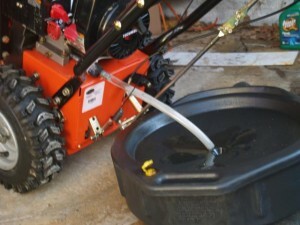 The best time to change the oil in your snow blower is in the fall when it is still relatively warm. No one wants to work in the cold weather doing this sort of job in their garage. The fall is the best time for another reason. The oil has been sitting in the engine block all summer. After being used in the engine during the previous winter. It is time to have fresh oil in the engine for the coming season to ensure that your snowblower delivers the best results. If your snowblower is used a great deal, you may even change the oil more often. Follow recommendations found in the user’s manual. Regardless of when you do this job, start the engine and let it run for 5 or 10 minutes to warm up the oil. This will ensure that it has a higher level of viscosity and will drain more thoroughly. Many snowmobile engines have a drain plug on the side of the engine block. The drain Plug is near the bottom of the engine block. Some like mine, have a 3 or 4 inch pipe with a plug on the end of it. If you remove the plug the oil is going to fall all over the gear housing or the tire. Depending on the location a great deal of oil could up on the ground. I always have a one foot long piece of hose available and a reservoir to catch the oil. As I remove the plug on the end of the pipe, I have the hose ready to place over the end of the pipe. I want the oil to drain through the hose and into the reservoir. This is just a handy little trick that helps me change the oil without making a big mess.